CARSON CITY, Nev. — Health care legislation is hanging by a thread in the Senate, and no one is under more pressure than Republican Sen. Dean Heller of Nevada. Heller was already seen as the most endangered GOP incumbent senator in next year’s midterm elections. He is the only one running for re-election in a state President Donald Trump lost to former Democratic presidential candidate Hillary Clinton. Against that backdrop, it’s hard to envision a more difficult political choice for Heller than whether to support the health legislation expected to come to a vote next week in the Senate. There are already two GOP senators opposed to the legislation, so one more “no” vote would kill the bill outright in a Senate divided 52-48 between Republicans and Democrats. Yet if he sides with the president and Senate leader and supports the bill, Heller would likely be parting ways with Nevada’s popular GOP Gov. Brian Sandoval, who has already expressed deep concerns about the legislation’s cuts to the Medicaid program for the poor and disabled. For Heller, it looks like a no-win situation. Heller, 57, took Senate GOP leaders by surprise with his outspoken opposition to an earlier version of the bill last month. He appeared at a press conference with Sandoval where both denounced the bill crafted largely in secret by McConnell. “I cannot support a piece of legislation that takes insurance away from tens of millions of Americans,” Heller said at the time. McConnell was forced to withdraw the bill in face of certain defeat. But the new version he unveiled Thursday also unravels the Medicaid expansion under former President Barack Obama’s Affordable Care Act, which has allowed more than 200,000 of the poorest and most vulnerable Nevadans to gain coverage. Sandoval, who made the decision to accept the Medicaid expansion, expressed serious reservations Friday about the latest version of the bill, though without expressing outright opposition. “My concern all along has been with the expansion population, the newly eligibles. There are approximately 210,000 of those in Nevada who are having a dramatically better quality of life and are living healthier and happier, and I just, those are the lives I want to protect,” Sandoval told reporters at a conference of governors in Providence, R.I.
Sandoval, who appointed Heller to the Senate in 2011 after a scandal forced his predecessor to resign, said he planned to talk with the senator later in the day. After Heller announced his opposition to the initial bill in June, a group linked to Trump launched a hard-hitting ad campaign against him. From the other side Democratic groups have already signaled they will use the issue against him in his re-election campaign, a fate Heller probably can’t escape no matter how he votes. 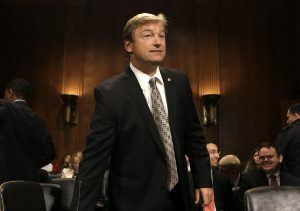 And Heller’s predicament is all the more notable in that it was a fellow Nevadan, former Senate Democratic Leader Harry Reid, who pushed Obamacare to passage in 2010, including by securing the votes of some very vulnerable Democratic senators who subsequently lost their seats over the issue. One of those lawmakers, former Democratic Sen. Mary Landrieu of Louisiana, expressed little sympathy this week for the Republicans who now find themselves in a position similar to the one that ultimately ended her political career. Werner reported from Washington, D.C. Associated Press writer Jennifer McDermott in Providence, R.I. also contributed to this report.